WEEKEND UPDATE — Next week I leave for my first visit to China, specifically to Anyang City, by train a couple hours south of Beijing where the seventh running of an annual airshow is planned. I have only a sketchy idea what to expect even though Shu Dong Li of the Aero Sport Association has briefed me as has my European counterpart (in our work for LAMA), Jan Fridrich. In the last year alone, Jan has made nine trips to China as the Czech government is assisting Chinese authorities in work to build personal aviation in that country. At the invitation of Shu Dong and Anyang City officials I was asked to speak at the event and I will join several other Americans all invited for the occasion. I expect this will prove interesting. While no one expect China to suddenly explode with light aviation activity, various groups are vigorously pursuing the future of recreational flying and this country has accomplished a great deal in a short time. Nonetheless, today, others report that the large country has only 329 airports and just 1,320 GA aircraft. 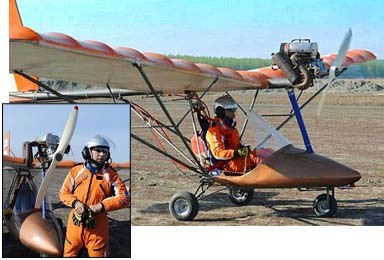 In an interesting coincidence, I discovered a story about a Chinese fellow who built his own ultralight from available materials and took to the air in it. He's not alone in this, of course, but I found his work an intriguing example of ordinary Chinese citizens showing an interest in flying for fun. An article in the Daily Mail amplified a story on ChinaNews.com about Mr. Shijun Yang, a 45-year-old China national. The article was accompanied with some decent photos, which I use here while giving full credit to the news organizations. According to the article Yang spent about $16,000 and more than a year building the plane, from plans he may have obtained off the Internet (photo). An executive at a building company, Yang has crafted the aircraft in honor of his deceased father, who worked as a pilot for 29 years. He named the plane "Jinhai" in memory of his father. The two news organizations reported that on a recent Sunday Yang successfully took off and landed 10 times in Jilin province, located in northeast China. According to writer Emily Chan he took the airplane up to 650 feet and has since logged 2.5 hours of flying time. Builder and pilot Yang said that his aircraft, allegedly "made from scrap metal," can reach a top speed of 120 kilometers per hour (75 mph) and has a cruising speed of 80 km/hr or 50 mph. Yang's ultralight-like airplane has a wingspan of about 30 feet and weighs 242 pounds. Journalist Chan reported that he has test flown his creation on two other occasions, including a 54-minute flight on his late father's birthday last September. As I looked at the photos for this airplane I knew it looked familiar, in particular a Flightstar, an ultralight in which I logged many hours in the mid-1980s. As chance would have it, about the time I stumbled across this story, I was enjoying a visit from an old friend and fellow LSA businessman, Tom Peghiny, known widely as the president of Flight Design USA. In fact, Tom is celebrated in the June 2015 issue of Plane & Pilot magazine, where his leadership in the Light-Sport community is chronicled. I showed the photos to Tom and with his intimate knowledge of Flightstar — after building nearly 1,000 of them before he become immersed with the Flight Design CT series of LSA — he swiftly confirmed my guess that this was indeed a Flightstar. Yang has modified the design in minor ways, for example, the forward support tube (aft and below the engine) is not exact to the U.S. version of Flightstar. OK, so Yang built a Flightstar apparently from some detailed plans. It may not be ground-breaking design work, but I still have to admire anyone who will tackle such a project in a country where aviation — at least at the ultralight level of aircraft — is virtually unknown. 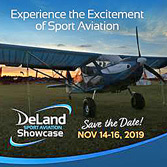 I look forward to my upcoming visit where I can learn more about this country's push to join the world in enjoyment of recreational aircraft. WEEKEND UPDATE — Next week I leave for my first visit to China, specifically to Anyang City, by train a couple hours south of Beijing where the seventh running of an annual airshow is planned. 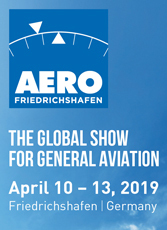 I have only a sketchy idea what to expect even though Shu Dong Li of the Aero Sport Association has briefed me as has my European counterpart (in our work for LAMA), Jan Fridrich. In the last year alone, Jan has made nine trips to China as the Czech government is assisting Chinese authorities in work to build personal aviation in that country. At the invitation of Shu Dong and Anyang City officials I was asked to speak at the event and I will join several other Americans all invited for the occasion. I expect this will prove interesting. While no one expect China to suddenly explode with light aviation activity, various groups are vigorously pursuing the future of recreational flying and this country has accomplished a great deal in a short time. Flightstar owner Tom Peghiny flew his E-Spyder for the first time on July 17th. Watch a video of E-Spyder's first flight. And watch next day flights. No gasoline was used in the making of these videos. Read FAQs on battery power. Part 103 continues to step from the shadow of Light-Sport Aircraft. We've had aviation's simplest rule (worldwide!) for 27 years and with few exceptions, most of those years saw Part 103 producers laboring in near-obscurity. *** Now, however, a new flurry of activity has developed at the beautiful intersection of genuinely lightweight aircraft with electric power. The very latest to roll into the spotlight is Flightstar's E-Spyder, which took its first flight today. E-power from Yuneec in China meets an all-American airframe. The accompanying photos show what a clean matchup these components achieve. *** Flightstar mounted the twin lithium polymer battery packs on either side of the design's robust main fuselage tube. Electric motors are more user-friendly in nearly every way, but you have some new learning to do. For example, experts advise never allowing lithium polymer batters to drain completely. Fortunately, the Yuneec controlling hardware provides warning systems to help you manage this task. *** Batteries last for at least 500 cycle charges and Yuneec says this equates to 250+ hours of flying. 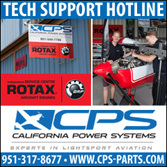 That many hours using a small gasoline engine like the Rotax 277 would cost around $10,000 in fuel alone, plus oil, overhaul costs, spark plugs and more such that the up-front cost for batteries is the rough equivalent of buying fuel for a gasoline engine for many years... but you'll never have to clean an oil mess. Part 103 continues to step from the shadow of Light-Sport Aircraft. We’ve had aviation’s simplest rule (worldwide!) for 27 years and with few exceptions, most of those years saw Part 103 producers laboring in near-obscurity. *** Now, however, a new flurry of activity has developed at the beautiful intersection of genuinely lightweight aircraft with electric power. The very latest to roll into the spotlight is Flightstar‘s E-Spyder, which took its first flight today. E-power from Yuneec in China meets an all-American airframe. The accompanying photos show what a clean matchup these components achieve. *** Flightstar mounted the twin lithium polymer battery packs on either side of the design’s robust main fuselage tube. Electric motors are more user-friendly in nearly every way, but you have some new learning to do. For example, experts advise never allowing lithium polymer batters to drain completely. Fortunately, the Yuneec controlling hardware provides warning systems to help you manage this task. On a glorious fall day over the undulating hills of northeast Connecticut, I returned to flight after a five-month hiatus. Encouraged and accompanied by my old friend Tom Peghiny we enjoyed an hour sightseeing flight over the verdant countryside surrounding Tom's Flightstar Sportplanes enterprise at the Woodstock airport. Gosh, it felt great to get back in the air! *** With the first revolution of the wheels I noticed how light the Flightstar seemed. I've done most of my flying in Light-Sport Aircraft lately and I guess I'd forgotten just how light ultralights can feel. We left the ground in a couple hundred feet lifted by a HKS 700E four stroke distributed by HPower. In an age of $100,000 LSA, this $25,000 Flightstar IISC certainly seems affordable to plenty of Americans. At 400 pounds less than LSA at gross, turns were pleasant low-gee maneuvers. No wonder pilots sell Cessnas to fly ultralights. On a glorious fall day over the undulating hills of northeast Connecticut, I returned to flight after a five-month hiatus. Encouraged and accompanied by my old friend Tom Peghiny we enjoyed an hour sightseeing flight over the verdant countryside surrounding Tom’s Flightstar Sportplanes enterprise at the Woodstock airport. Gosh, it felt great to get back in the air! *** With the first revolution of the wheels I noticed how light the Flightstar seemed. I’ve done most of my flying in Light-Sport Aircraft lately and I guess I’d forgotten just how light ultralights can feel. We left the ground in a couple hundred feet lifted by a HKS 700E four stroke distributed by HPower. In an age of $100,000 LSA, this $25,000 Flightstar IISC certainly seems affordable to plenty of Americans. At 400 pounds less than LSA at gross, turns were pleasant low-gee maneuvers. A great old name has returned! The Flightstar is back. Actually, the design has survived various ownership changes quite well. The original Pioneer Flightstar became the Argentine Aviastar. Now original designer, Tom Peghiny, has bought the plane and the name. It's all-American again, too, made in the USA. Above you see the F.A.R. Part 103-legal version, the Flightstar Classic. The Classic has a big brother single seater and of course, a two-seat trainer. The Classic is the company's primary fun machine, though. All the Flightstars were designed under accepted engineering methods. They've also been given the touch by Peghiny, an ultralight pioneer who aviation business experience dates back to his teens. It's easy to see this successful combination if you examine individual component design and finish. The Flightstar has an avid following of five hundred owners who love the way their planes fly. The Classic has simple features and low price while maintaining wonderful handling qualities. The side-mounted joystick delivers a smooth linkage feel with response both predictable and authoritative. Performance is solid. The light single will sustain altitude at a low power setting, even on a 28 horsepower engine. Flightstars are strong throughout their speed envelope. The Classic makes for a good choice in a legal ultralight at a fair price. Being a quick bolt-together kit doesn't hurt. Full Review in Nov. '93 UF! A great old name has returned! The Flightstar is back. Actually, the design has survived various ownership changes quite well. The original Pioneer Flightstar became the Argentine Aviastar. Now original designer, Tom Peghiny, has bought the plane and the name. It’s all-American again, too, made in the USA. Above you see the F.A.R. Part 103-legal version, the Flightstar Classic. The Classic has a big brother single seater and of course, a two-seat trainer. The Classic is the company’s primary fun machine, though. All the Flightstars were designed under accepted engineering methods. They’ve also been given the touch by Peghiny, an ultralight pioneer who aviation business experience dates back to his teens. It’s easy to see this successful combination if you examine individual component design and finish. The Flightstar has an avid following of five hundred owners who love the way their planes fly. The Classic has simple features and low price while maintaining wonderful handling qualities. "New & Improved" boasts the advertising for the Flightstar IISL as it was introduced at the start of the 1999 season. Indeed, the statement proved to be more than a catchy advertising slogan. The already-popular ultralight from the Connecticut company managed to go one better than earlier models. A series of changes subtly advanced the state of the art for one of America's best ultralights. A new cabin fairing was cunningly reshaped to combine smoothly with a new, curvier windscreen. The aft-cabin fabric fairing was made leaner and smaller yet more efficient. And a new engine cowling improved cooling for the Rotax 503 engine installation. The combination of front and rear fairing harmonized to bring smoother touchdowns eliminating the one nagging challenge I'd found in the older IISL. Making consistently smooth landing roundouts is now child's play. Builders will also appreciate the easier fit of the new fiberglass parts and shipping is more compact (therefore cheaper) than ever due to the change. The new windscreen improves visibility while allowing a full enclosure for those in cooler climates (becoming the IISC, for "Sport Cabin"). While you stay warmer, though, the engine runs comfortably cool thanks to the cleverly designed SuperCowl that provides a smooth inlet and exit ramp for air coaxed past both cylinder heads. The physical changes of the improved IISL are backed up with quick delivery and a customer service record that any buyer would love. Plus it's hard to argue with 1,000 flying models and an excellent safety record. “New & Improved” boasts the advertising for the Flightstar IISL as it was introduced at the start of the 1999 season. Indeed, the statement proved to be more than a catchy advertising slogan. The already-popular ultralight from the Connecticut company managed to go one better than earlier models. A series of changes subtly advanced the state of the art for one of America’s best ultralights. A new cabin fairing was cunningly reshaped to combine smoothly with a new, curvier windscreen. The aft-cabin fabric fairing was made leaner and smaller yet more efficient. And a new engine cowling improved cooling for the Rotax 503 engine installation. The combination of front and rear fairing harmonized to bring smoother touchdowns eliminating the one nagging challenge I’d found in the older IISL. Making consistently smooth landing roundouts is now child’s play. Builders will also appreciate the easier fit of the new fiberglass parts and shipping is more compact (therefore cheaper) than ever due to the change. Daring to take on deeply entrenched Rotax, Flightstar/H-Power has introduced the first light aviation four-stroke engine to see broad acceptance. Joined with their smoothly contoured Flightstar II, you can have a deluxe ultralight or lightplane that will provide years of flying enjoyment. While two strokes do the job for most ultralight enthusiasts, the four stroke 700E engine from HKS of Japan offer assurances some pilots demand. With its particular strength of mid-range torque, the HKS engine brings interesting differences. Pull up the nose while revolutions are set in the 4000s and the HKS will haul the Flightstar II aloft with no evidence of prop loading common among two stroke engines. Flightstar still sells lots of their very popular IISL models, but on this lighter aircraft, they recommend the Rotax 503. However, now that the same company has adapted the stronger HKS engine, sales are soaring for their Flightstar II with its beautifully formed all-fiberglass cockpit enclosure. The slight increase in empty weight is easily lifted by the 700E. Designer Tom Peghiny and partner Spark LaMontange make sure buyers of either Flightstar or HKS will get service to please even the most demanding buyer. Kits shipped under license from Florida giant Leza-Lockwood get you a 100%-complete kit in less than a week. Long admired Flightstar aircraft quality joins with world respected Japanese engine expertise to bring a fun flying machine that can be assembled quickly thanks to a well-executed kit. All that remains is the easy flying nature. No wonder nearly 1,000 are flying around the globe. Daring to take on deeply entrenched Rotax, Flightstar/H-Power has introduced the first light aviation four-stroke engine to see broad acceptance. Joined with their smoothly contoured Flightstar II, you can have a deluxe ultralight or lightplane that will provide years of flying enjoyment. While two strokes do the job for most ultralight enthusiasts, the four stroke 700E engine from HKS of Japan offer assurances some pilots demand. With its particular strength of mid-range torque, the HKS engine brings interesting differences. Pull up the nose while revolutions are set in the 4000s and the HKS will haul the Flightstar II aloft with no evidence of prop loading common among two stroke engines. Flightstar still sells lots of their very popular IISL models, but on this lighter aircraft, they recommend the Rotax 503. However, now that the same company has adapted the stronger HKS engine, sales are soaring for their Flightstar II with its beautifully formed all-fiberglass cockpit enclosure. The popular Flightstar is solidly an American aircraft again after an excursion with overseas ownership. Original designer, Tom Peghiny, and his partner, Sparky LaMontagne, are majority owners in the Connecticut-based ultralight manufacturer. 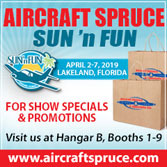 They've introduced four models to the community: Flightstar Classic (277 engine), Spyder (447-powered single place), Formula (deluxe full enclosure single seater) and Flightstar (top of the line two-place aircraft). The Flightstar line distinguishes itself by featuring well engineered designs with cleanly executed hardware on a sleek, solid design. As they pass by in an airshow demonstration, viewers are pleased by the quiet performance of the machines. Factory pilots fly their two place model with the lighter 503 engine; it's more than enough engine though you can add the more powerful 582. They go fast as well as slow and handle well at either end of the envelope. Present models offer flaps to further extend the speed range. Efficiency is a watchword with the Flightstars. Qualities that prove this include low-noise, low-vibration operation, an ability to use less powerful engines, and the ability to stay aloft on deeply reduced power settings. You don't have to be very technical to see the designs illustrate a great attention to detail. A mature design, with nearly 1,000 flying all over the world, the Flightstar has been thoroughly analyzed and updated over the passage of time. Build times are very low owing to a builder-friendly design, factory built subassemblies, and slip-on Dacron wings. Cabin appointment contribute to an exceptionally quiet ultralight environment, and considerate control layout. The latest Flightstars are real crowd pleasers, true, but more importantly, they please their pilot/owners. Just try to pry one away from his Flightstar. Flightstar was featured in the October 1994 and November 1993 issues. The popular Flightstar is solidly an American aircraft again after an excursion with overseas ownership. Original designer, Tom Peghiny, and his partner, Sparky LaMontagne, are majority owners in the Connecticut-based ultralight manufacturer. They’ve introduced four models to the community: Flightstar Classic (277 engine), Spyder (447-powered single place), Formula (deluxe full enclosure single seater) and Flightstar (top of the line two-place aircraft). The Flightstar line distinguishes itself by featuring well engineered designs with cleanly executed hardware on a sleek, solid design. As they pass by in an airshow demonstration, viewers are pleased by the quiet performance of the machines. Factory pilots fly their two place model with the lighter 503 engine; it’s more than enough engine though you can add the more powerful 582. They go fast as well as slow and handle well at either end of the envelope. Present models offer flaps to further extend the speed range. Efficiency is a watchword with the Flightstars. NEW GLASS - Though you may have to look hard to see the differences in the new forward fairing on the Flightstar II series, it actually works well to improve flight in the popular design. ALL NEW? - Against a darkening sky, the light and airy Flightstar II SL shows off its new features: a new cockpit fairing, new engine cowling and new windscreen. Not seen is a new aft cockpit fairing. DUAL CONTROLS - The Flightstar II has always had dual flight controls, but the addition of a second elevator push-pull housing is new. This adds assurance that the valuable control surface remains operational at all times. FASTER BACK - In Flightstar's second version of the their lightweight fastback fabric fairing, the surface got smaller and tightened for a smoother flow of air. The tail notices, and landings are easier than ever. MAJOR PANEL - Though Flightstar tends not to load up their panel, it certainly has ample room for those who like more gauges and knobs to look at during flight. Note the full dual controls, as well. POPULAR ENGINE - Even though Flightstar promotes the HKS 700E 4-stroke engine (imported by sister company HPower Limited), they still very much advocate the Rotax 503 2-cycle, which provides plenty of power to the light 2-seater. 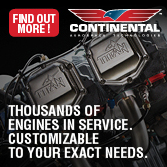 IN AND OUT - Flightstar's custom-designed Supercowl engine cowling adds significantly to the airflow traveling through the cooling fins of the Rotax 503 engine. It's fabricated by Jiri Sychrovsky of Cured Composites, the same man who built the new cockpit fairing. NEW AND IMPROVED - The fairing is new and the engine intake cowling is new, as is the new windscreen, which can barely be seen in this view. A windscreen you can't see is a good thing. BIG GUYS - While Flightstar Sportplanes partner Spark Lamontagne in the aircraft's right seat is of average height, Phil Lockwood of Leza-Lockwood in the pilot's seat is quite a bit taller than average, though he appears to fit nicely. Standard Features Full dual controls with dual left-hand throttles, folding wings, steerable nosewheel, fiberglass nose pod, 3-point shoulder harness pilot restraints, streamlined struts, dynafocal engine mount, Rotax B gearbox, engine cooling air scoop, 2-blade wood prop, rotationally molded fuel tank with sump and drain. Options HKS 700E 4-stroke engine, Rotax 582 2-cycle engine, Rotax C or E gearbox, electric start, flaps, in-flight adjustable elevator trim, nondifferential main wheel drum brakes with center-pull brake lever, 4-point shoulder harness pilot restraints, ballistic emergency parachute, instruments (ASI, altimeter, EGT, CHT, tach, hourmeter), 3-blade composite prop, cabin enclosure, rear enclosure, floats, Mylar® no-paint covering. Construction 6061-T6 aluminum tubing, welded 4130 chromoly steel cage and landing gear, fiberglass pod, presewn Dacron® sailcloth covering. Pros - Based on a popular and successful design, company has added new improvements that genuinely improve the breed. Two-seater operates very well on the 52-hp Rotax 503 dual carb, a simple well-regarded engine choice; available with larger 65-hp Rotax 582 2-cycle engine or the 60-hp HKS 700E 4-stroke. Standard folding wing. Engine cooling cowling looks good and is reported to work effectively. New pod makes for easier shipping and assembly. Cons - Flightstars sit rather low to the ground and have a tractor engine; one or both may turn off some buyers. Given the many improvements over the years, it's increasingly hard to find fault with the Flightstar II SL's overall design. Pros - With lots of weight to spare (at 365 pounds empty), the Flightstar II SL can add optional systems and still meet the weight limit for ultralight trainers. New instrument panel is large enough to allow gauges and radios. Comes standard with desirable features like full dual controls and folding wings. Center-pull (brake handle) brakes are very effective. Effective in-flight trim (an option). Cons - Adding lots of systems - even the company's enclosed cabin (II SC "Sport Cabin") version - will add weight to a design that has been carefully lightened over the years. Making brakes differential would require customized hardware. To further simplify and lighten, flaps are an option. Test ultralight had pull starting from outside only. Pros - New front-end fairing aids entry to cabin for those with long legs or less flexibility. More knee room thanks to raised lower edge of panel. New windscreen material is tinted. One of the most comfortable yet simple seat arrangements in the industry (a plastic seat pan in a padded sling-style seat). Side-by-side seating is preferred by most flight instructors. New cabin allows some pressure on floor when entering. Cons - Low posture of ultralight means some older pilots may have extra difficulty entering and exiting. Windscreen on test ultralight (first public example) was not crystal clear. Ground clearance is greater on many other ultralights. Full enclosure is available, but consists of snap-on zippered doors and "roof" that some buyers may not like. No cargo area. Pros - Precise easily-handled nosewheel steering. Welded chromoly steel main gear is very stout, yet bumps are smoothed by bungee suspension system. Effective drum brake system activated by center handle offering great leverage. Aircraft sits on its tri-gear (i.e., doesn't tilt to the tail like some tri-gear ultralights). Low ground posture makes II SL very stable. Cons - No differential braking to aid ground maneuvering. Upward visibility somewhat restricted while, for example, checking pretakeoff traffic. Pros - One complaint I had about earlier II SL has been cured: touchdown now is smoother and less abrupt (reshaped nose fairing is partly responsible, as is reshaped aft fairing). The first Flightstar II SL improved landings from older (and heavier) AviaStar, and this version finishes the job. Superb visibility on landing approach. Good crosswind capability. Cons - Longer takeoff/landing than some very slow-flying ultralights. More efficient aerodynamics causes longer ground effect float, for which the pilot must be ready (this is a good thing, but one that demands better approaches). Pros - Roll rates and pressures improved over older II SL by shortening aileron span while increasing area slightly. Overall control in Flightstars may be about ideal for most buyers: not too fast, but predictable response. Good crosswind controls. Precision turns to headings comparable to any certified aircraft. Elevator linkages now have dual push-pull system adding assurance. Cons - Leading with rudders helps coordination (making it a little different than certified aircraft). Despite earlier efforts, rudder throw is still a little short of optimal (noticed mainly on deep-angle slip attempts). Pros - Standard engine now boosted to 52-hp Rotax 503 dual carb, adding 6 horsepower (compared to 503 single carb). Climb enhanced (though not quantified in this evaluation). 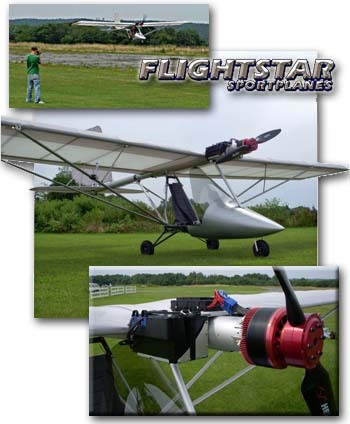 Flightstar retains the ability to fly fast or slow with equal ease over a broad range. Able to fly with very low engine rpm setting, which indicates good aerodynamic efficiency; was always a strong point of the design, now further improved by front and aft cabin fairings. Cons - High-speed cruise has never been a Flightstar quality (though new fairings may have bumped the figures a couple mph). No other negatives. Pros - Stalls are very mild and can occur down to the very low 30s. Virtually no tendency to tighten up in steep turns or accelerated stalls. Large-diameter chromoly cage is very stout in the event of mishaps. Three-point harness system is standard (4-point optional). Flightstar has worked closely with BRS on airframe positioning of emergency parachutes. Cons - Full-power stalls cause the nose to wander and have no defined stall break. No other negatives. Pros - With kits manufactured for the last 5 years by Leza-Lockwood, Flightstar HQ can concentrate on customer service, research and development, and flight training; company well-regarded in these activities. Well-tested and documented design has an excellent safety record, with more than 800 Flightstars flying worldwide. New pod allows easier assembly by owner, is more rigid, and requires no painting (unless you insist on adding weight). Upgrade options include an enclosed cabin and many accessories. 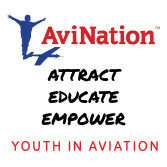 Cons - With kits manufactured for the last 5 years by Leza-Lockwood, Flightstar HQ can concentrate on customer service, research and development, and flight training; company well-regarded in these activities. Well-tested and documented design has an excellent safety record, with more than 800 Flightstars flying worldwide. New pod allows easier assembly by owner, is more rigid, and requires no painting (unless you insist on adding weight). Upgrade options include an enclosed cabin and many accessories. Since Tom Peghiny and partner Spark Lamontagne first lightened the Flightstar and named one model the II SL (for “Sport Light”), they haven’t been able to sit still and simply admire their work. From our first pilot’s report on the SL 3 years ago,1 the two have tweaked and adjusted the model to find even better qualities. A new front and aft fairing are part of the package, and the latter you might notice rather quickly. Virtually all the rest of the improvements are subtle things. In fact, that word is a hallmark of Flightstar innovation. No surprise then that the company should adopt “New and Improved” as its new advertising headline to assure you know about the changes. Better and Better I’ve followed the Flightstar from its first flight, when it wasn’t even the Flightstar. This design – which once crossed the Atlantic – is from the inventive mind of Swiss national Hans Gygax, and became the rather gaudy 440ST. EVER REFINED - The Flightstar has changed so little yet so much over the years. Still the same great basic ultralight, the newest Sport Cabin model is the slickest package yet. OLD & NEW - The tapering section of the fuselage is old (well, a year or so) while the fiberglass aft of the door is new. As part of designer Tom Peghiny's constant effort to improve airflow, cargo space comes as icing on the cake. COMFY & SECURE - Flightstar's seats have long impressed me: lightweight yet easy on the back thanks to the shaped plastic seat pan. Fully adjustable 4-point seat belts keep you comfortably in your seat. MUCH ATTENTION - Out of the hundreds flying successfully, one Flightstar developed a problem with the elevator push-pull cable. The company quickly doubled the cable to be doubly sure, typical of their thoroughness. SMILES AROUND - Flightstar Sportplanes has an experienced staff that loves what they do. Flightstar partner Spark Lamontagne (center) is flanked by Ultralight Flying! photo plane pilot and Shuttle America Captain Jonathan Carter (right) and Dinny Slater. EASY INSTALLATION - Installing the Flightstar II SC doors is a snap - or more like a zip. Here a Flightstar representative shows how easy it is to install the doors, finishing to a fully enclosed cabin. DUAL DUTY - Not only does the fiberglass fairing offer smoother air movement past the cockpit, it also provides a clean transition to add the zip-on doors that helps this fully enclosed cabin remain lightweight. TOP & BOTTOM - The Flightstar nose pod has evolved a lot over the years. Once it protected your nose and some of the bottom. Now a fully enclosed top lets in some light and matches the fully enclosed bottom. 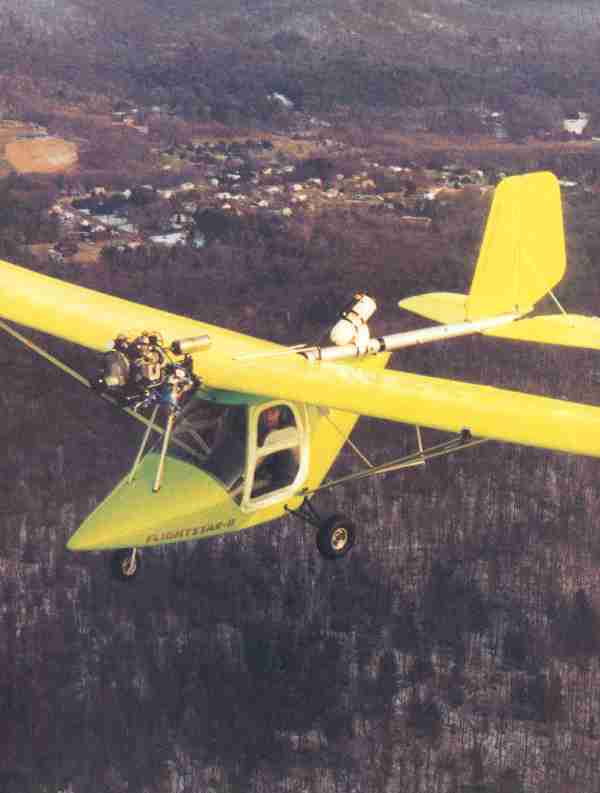 In August 1999,Ultralight Flying! reported on the Flightstar II SL. Thirteen months later, another report is needed as, once again, Tom Peghiny and Spark Lamontagne have upgraded their principal selling model. Flightstar is the name of the plane and Flightstar Sportplanes is the name of the company, and "refinement" ought to be permanently attached. I've followed many ultralights over many years. Some have changed a lot, some have seen almost no change. The Flightstar has almost constantly evolved. Why change this successful design? After all, it costs money to design, test and build new parts inventories. It takes time and more money to update assembly manuals. Why do all this if the ultralight is doing well? The reason is simple: to make a better product that more people will buy. At least the answer sounds simple; in fact, it may be surprisingly complicated to achieve. Before we get into how the ultralight flies, let's review what makes this Flightstar II SC (Sport Cabin) different from the Flightstar II SL (Sport Light). Looking Back a Moment A little history is needed first. Once there was a Flightstar. It was a simple and light single-seater, and it found favor in the marketplace of the early 1980s when ultralights were the new darlings of sport aviation. 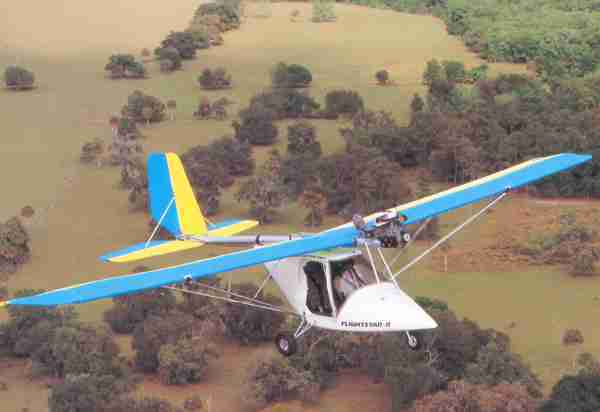 After a few years of playing with ultralights, then-owner Pioneer Parachutes (through a subsidiary company named Pioneer International Aircraft) chose to exit aircraft production and sold the rights to an Argentine company. In the way of most non-U.S. builders, the Flightstar - renamed AviaStar - got heavy and loaded with equipment. As with many European aircraft, the AviaStar tried to be a little general aviation aircraft for a country where owning and operating a Cessna or Piper is prohibitively expensive. If you want a Cessna Skyhawk but don't have the budget, what you may buy is an ultralight dressed up to assume a Skyhawk-like image. That AviaStar was well assembled, building on the thorough work done by Pioneer engineers but it was heavy and complicated to a fault, in my opinion. It was far from a perfect little airplane in that it didn't have sprightly ultralight performance and agility, nor did it have the cabin comfort and transportation potential of a Skyhawk. When Tom Peghiny first negotiated to buy the brand name and to bring it all back to the U.S., the first thing he and partner Spark Lamontagne did was to start lightening the now-revived Flightstar. That work has never stopped in the decade of Flightstar Sportplane's existence. In fact, change seems to be a hallmark of the Connecticut-based company. Bits and Pieces As the Flightstar evolved it went through a few noteworthy phases. First came the Flightstar II SL, with the SL standing for Sport Light. 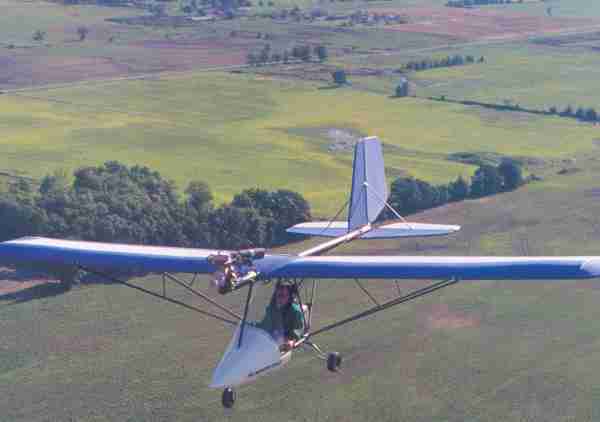 Peghiny and Lamontagne sliced an amazing 55 pounds off of the old AviaStar and created an ultralight that, in my estimation, flew far better and better addressed the U.S. market. Next came the Flightstar II SL with its sporty-looking fastback aft fairing. Unlike the all-fiberglass Flightstar II, this aft fairing was made of fabric, which added very little weight. Then came a modified fastback to a shortened version that not only looked lighter but which improved airflow past the tail. 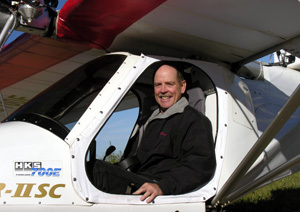 Designer Tom Peghiny has a long background in hang gliding and model building where airflow is examined with greater interest than for many plow-through-the-air ultralights. As part of the laminar investigation the company completely redesigned the nose fairing and windscreen which brought numerous benefits, among them improved landing flare authority which had been a rare weak point. In the new millennium the two partners introduced their Flightstar II SC - SC standing for Sport Cabin - and the popular 2-seater has again gone through a design iteration. Since the newest refinements don't change the overall look much, it is worthwhile to examine some of the differences in detail. Customers wanted doors for some climates, and to gain other benefits from a full enclosure. They'd been able to select the Flightstar II with its sleek fiberglass cabin, but this model is heavier, more costly, and harder to build than the new SC model. 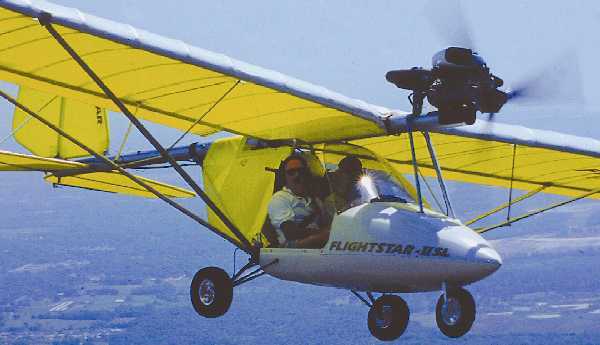 To maintain the lightness that had put Flightstar Sportplanes back in the forefront of American ultralights, Peghiny and Lamontagne went to some trouble to create a full enclosure that wasn't as heavy as on the Flightstar II. The doors would be fabric, like many other ultralights have used and which resemble the doors on Quicksilver's GT 500. Doors like this just don't get any lighter. However, those doors needed some rear structure that didn't exist on the Flightstar II SL. To assure this - and at the same time offer some "saddlebag" storage (as for a jacket) - aft cabin fairings were developed. More than cargo containers and seat backs, these fairings again help improve airflow, which in turn helps make the tailplane even more effective. The aft cabin fairings coordinate well with the new nose fairing and shaped windscreen that we saw in the August '99 issue of Ultralight Flying! magazine. Put together, the fabric doors now smoothly integrate with the whole cabin. For warmer climates, the SC's doors can be swiftly unzipped and removed. The nose fairing now allows you to place your feet firmly on its floor, which has a foam core to help strengthen it. Unlike the old hard-to-ship and hard-to-assemble nose fairing, the pod now has a belly pan (with the firmer floor) and a much lighter upper half. To see the difference look at the cockpit photo with the hand pulling up on the brake lever. As you look across the cockpit you can see the start of the Flightstar name showing clearly through the light fiberglass where the sun illuminates it. Speaking of illumination, part of the cabin assembly includes a roof. While the older full enclosure also has a roof, it was solid fiberglass and it came down lower, much like pulling a ball cap low onto your head, expressed Peghiny. The new Lexan® roof lets light in and doesn't descend as far. Not only does this permit a broader view of the engine, but it also tends to feel less claustrophobic inside. A series of specially designed fiberglass parts have a lip, which fits neatly to the Lexan® windscreen and roof to complete the interior in a pilot-friendly way. In all, the SC cabin is a whopping 14 pounds lighter than the Flightstar II all-fiberglass cabin. And it's much easier to build. The older fiberglass came in gray, needed to be trimmed and drilled, and owners commonly spent $500 just painting it, says Peghiny. The more elaborate fiberglass shapes were larger parts that builders didn't want to damage (or drill incorrectly), and they were also more difficult and costly to ship than the newer modular elements. The newer fiberglass parts - made for Flightstar by George Sychrovsky's Cured Composites company - arrive in gleaming white epoxy primer, trimmed, drilled, and ready for installation. You can simply wax the fiberglass and install, or degrease and paint to suit. No sanding is required as Sychrovsky polishes the molds to achieve a smooth production finish. If you still aren't sure you need a full enclosure, here's a nifty situation: the SC cabin update can be purchased later and added to an existing Flightstar II SL. As the heat of summer makes you resist being cooped up, you can simply save your pennies and add the enclosure when Mother Nature introduces us to another winter. For $800 you get the doors, roof, doorjambs (see white panels on the trailing edges of the windscreen), and the aft cabin fairings/saddlebags. Not only does the new shortened fabric fairing have a handy zippered access panel for preflight inspections, but Peghiny reports the entire aft fairing and aft cabin fairing panels can be completely removed in 20 minutes. (On the SL model the aft fairing can be removed in a mere 2 minutes, he says.) About the only downside to the new SC cabin enclosure is the lack of a solid exterior-accessed fuel spout. Now, you must unzip the fabric fairing opening, undo the cap, and slip a filler tube down inside the fairing at a point near the aileron lever arm. It sounds awkward, but Peghiny says it isn't. The other major changes to the Flightstar II SC that I evaluated were the improvements to the 60-hp 4-stroke HKS 700E engine. See the sidebar, "The 2000 HKS" for details. Gone Aloft Cabin and creature comforts are important. You need only look at the interior of any pickup truck to see that, even in work vehicles, sales are aided when the occupants feel comfortable. Yet descriptions of the Flightstar II SC's sharp interior and protective enclosure don't say much about how the ultralight flies, which is why we get involved with ultralights. The new and improved nose looks good, of course, but it also beautifully improves landing controls. The Flightstar series had always had nice handling and good performance, but though an approach to landing was easy enough, the flare to a smooth touchdown was often less satisfactory. It's a point of pride with many pilots to make smooth arrivals; I'm no different. In the older Flightstar II models (the single-place Flightstar never had this drawback), a wonderful approach was often followed by plopping ungracefully on terra firma. It wasn't a matter of bending parts, but somehow the finesse needed for a really pretty touchdown eluded me. Practiced Flightstar II pilots didn't have any problem, but you had to acquire a touch that I managed to lose between Flightstar flights. The combination of many improvements which clean up the air flow to the tail have restored my pride by making landing touchdowns as easy as the best ultralights. I understand the aerodynamic principles at work but it is nonetheless satisfying on a visceral level to make smooth landings over and over. You feel the expert ultralight pilot and who couldn't like that? In the II SC, you don't mess with flaps. This is not new to the SC model, but does simplify the overall landing process. Given the design's ability to slip well, flaps become unnecessary. In addition, I'll bet builders won't mind the timesaving not having to rig and adjust the extra set of movable surfaces. In the earlier II SL model (without full enclosure) I found wind fluttered my outside shirt sleeve constantly, too much so for cold climate flying. But from the newly shaped nose, past the molded windscreen, and on past the aft cabin fairings, the cabin has been effectively widened and the flapping shirt mostly disappeared. Wind feels good in warm climates but on a long flight it contributes to fatigue. The result of the fuselage-smoothing techniques gives the tail greater power in low-speed, high-angle-of-attack flight modes like imminent touchdown. Even though the Flightstar II SC has less fuselage area than some ultralights, the ultralight slips very well. I feel it could use a bit more rudder deflection to get deep slip angles, but average slipping technique is all that's needed to allow good approach path control. Flightstar is smart to lose the flaps in the interest of simplicity and light weight. It's a good thing slips are easy as this control technique is a required skill in the new II SC. The cleaner-than-ever Flightstar floats along quite efficiently in landing, as partner Spark Lamontagne had told me. I found it easy to sense the II SC's increased glide. Fun Flightstar Flying Flightstar's good combination of control speed and power make crosswind operations reasonable in moderate conditions. It also means the ultralight is a joy to fly. Handling is light and pleasant but not fast or sudden. Though some pilots may demand more roll rate and lighter stick forces, I believe most ultralight pilots can practically define good handling by the settings the Flightstar factory has chosen. In the beautiful spring skies above Florida, the Flightstar II SC equipped with the new 700E buzzed gently along at 4,500 rpm. When you raise the nose you need no throttle change. With most 2-strokes, you feel the prop load up and the engine labor when you climb sharply. Yet pulled up by the HKS, no such loading was perceptible right up to stall. Lamontagne explains that a flatter torque curve is responsible. My sensation was that it felt like many general aviation aircraft I've flown. In the Flightstar II SC with two onboard, we maintained altitude with less than 4,000 rpm. At this setting and given less general engine-related noise, the 2000 HKS sounded like it was not working hard. With a fuel burn rate of 2.5 gallons per hour, Flightstar pilots will also find something to like with the 2000 HKS engine, specifically, low operational cost and never any gas and oil to mix. Compared to a 50-hp Rotax 503 installation - which the Flightstar factory will happily sell you as they like this engine - the 2000 HKS brings a power boost. You'll see a couple miles an hour more speed, but possibly not much more climb rate. A 503 with pull starter is lighter and the HKS uses some of its extra power output to lift the additional weight. Compared to the 65-hp Rotax 582, the 700E has 5 less horsepower and a few extra pounds. The 2000 HKS is not an identical replacement but is a different engine experience. You'll like it if you try it and I know my hearing benefited from the quieter, smoother operation. Reliably Comfortable The Flightstar II SC's greater tail efficiency makes the already pleasant stall characteristics even more uneventful. Flightstar has always had good stability in all flight regimes. But I suspect the more orderly airflow over the tail at slow speeds - as seen in the landing touchdown phase - helps the pilot recover from stalls. With its 4-stroke HKS engine mounted above the center of gravity, the Flightstar II SC produces a level attitude when full power is added from cruise trim. However, I did not find that it would produce any significant lowering of the nose. Contrarily, decreasing power does lower the nose as you might expect. Disturbing the stick after establishing trim cruise gave positive results as the Flightstar returns to level with minimal oscillations. Flightstar Sportplanes is an outspoken advocate of ballistic emergency parachutes, using them on their airshow display models faithfully. 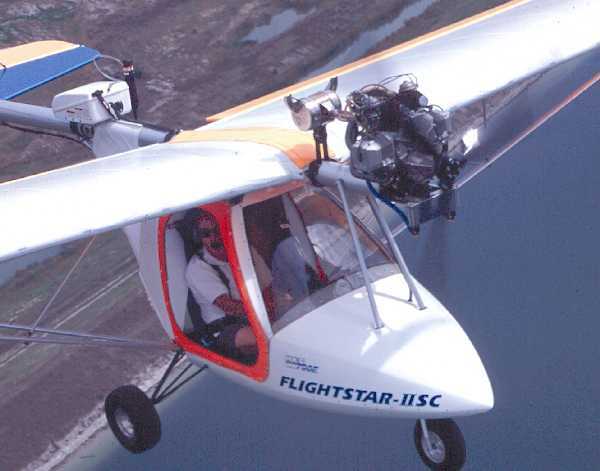 "Most Flightstar customers order a parachute," reports Peghiny. Flying new ultralights as I regularly do, safety items are appreciated. All in all the Flightstar II SC is a deluxe ultralight aircraft package that any pilot can enjoy. Since you can start with the more basic SL model of Flightstar and add the SC option later, you can get started for less and progress as you find comfortable. Standard Features Full dual controls with dual left-hand throttles, folding wings, steerable nosewheel, mechanical brakes, in-flight trim, fiberglass nose and aft cabin fairings, 4-point seat belt system, streamlined struts, dynofocal engine mount, composite 3-blade prop (on test model), dual elevator push-pull linkage, rotationally molded fuel tank with sump and drain. Options HKS 700E engine (as tested) with electric starter, additional instruments, ballistic parachute, special Mylar wing coverings (as tested). Construction 6061-T6 aluminum tubing aircraft with 4130 welded chromoly steel cage and landing gear, fiberglass nose and aft cabin fairings, presewn Dacron® sailcloth covering in various colors (no painting needed). Pros - Popular and successful design with more than 800 flying. Regularly refined ultralight but many improvements can be retrofitted. New enclosure strikes excellent compromise between protection, good looks, and light weight. New 2000 version of 4-stroke HKS is even quieter and features lower operating costs. Folding wing is standard. 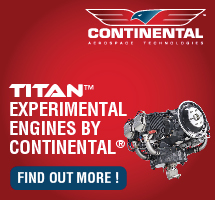 Cons - Not all buyers like the tractor-mounted engine despite its potential safety advantage. Sits low and doesn't offer bush-flying potential as well as some other designs. Some buyers actually won't like the evolving nature of the design as it means anything they buy could seem old in a few years (much like any computer you buy). Cons - No flaps, which it hardly needs but some pilots can't bear to part with them. Yes, you can add weight (and stay within exemption limits) but you'll start undoing the hard work of the company to lighten the design. Operating a 4-stroke may require you change your learning experience with 2-stroke ultralights. Pros - Relatively quiet inside the cabin, even at cruise speed. New roof construction imparts an airy feeling unlike the Flightstar II all-fiberglass enclosure. Full dual control system - and side-by-side seating - makes any of the Flightstar II line perfect for training. Center pull brakes are easily accessed by both occupants and work with remarkable effectiveness. Okay to put pressure on the floor. Some cargo area in dual "saddlebag" compartments. Cons - If you must have differential brakes, you must create the hardware. Though they're comfortable, the sling seats with their reinforced seat bottom may not fit the widest pilots. Ground clearance is not generous enough for some rough fields. Pros - low profile assures good taxi stability even in moderate winds. Fuller enclosure means less soil or debris enters the cockpit. Main gear is stout yet rides well, thanks to bungie suspension. Brakes actually slow and stop ultralight quite well. Sits in "normal" posture, that is, on all three gear. 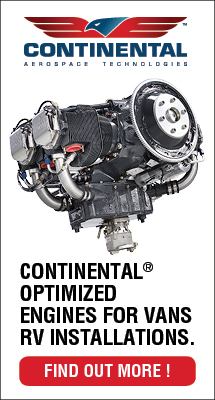 Cons - Those who demand differential braking (needed or not) won't find it on the Flightstar II SC. Seeing upward, as to check traffic before takeoff, is somewhat restricted by close overhead wing and fuller enclosure. Ventilating a closed II SC means unzipping the door, an action not quick to undo for expedited takeoffs. Pros - Every landing I made in the II SC had a smooth touchdown, a pleasant contrast to my experience with older Flightstar II models. Smoother airflow to the tail helps this quality and also creates improved stall controls. Great landing view; no problem judging your approach. 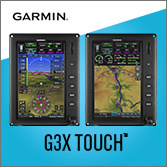 Controls are adequately authoritative for landings in most flying conditions. Cons - Improved aerodynamic efficiency means better energy retention which means longer ground-effect glides; pilots of less efficient ultralights may need to refine their landing techniques. HKS engine doesn't offer the steep climb of the Rotax 582 (though it's still plenty). Some ultralights leave the ground quicker and land shorter, if that's important to you. Pros - Excellent combination of control response and stable operation; I believe Flightstar Sportplanes offers what most ultralight pilots seek. Good power to handle most crosswind conditions or airborne turbulence. Elevators now use standard dual push-pull links to assure redundancy; makes for smooth - if slightly heavier - control action. Cons - Those yearning for lightning-fast controls must look elsewhere for happiness. Like many ultralights (but unlike most general aviation planes) you should lead slightly with the rudder for best control harmony; full-span aileron power appears greater than the rudder. Some may prefer more rudder throw. Pros - Cruising with the 2000 HKS engine is a thing of joy: low noise, low vibration, low fuel usage and it all means less overhaul hassle. Also beautiful is the way you can pull up the nose without needing to adjust the throttle. Performance doesn't usually include quietness, but since the HKS Flightstar II SC performs well, its low noise is appreciated. Cons - Who couldn't love the new 60-hp HKS, except of course the company asks a good chunk of change for it. Not the fastest horse in the stable (though this helps keep it under the training exemption). Climb is not as strong as the 65-hp Rotax 582 offers (but at about 750 fpm, it is certainly enough). With doors removed, cruise may suffer a mile an hour or two. Pros - Excellent longitudinal and directional stability are reassuring in rougher conditions. Novice pilots will love the II SC's stability characteristics. Tail works more effectively with improved airflow, creating even more benign stall characteristics and they were already great. Four-point seat belts and a ballistic parachute system made me feel even better in this stable design. Cons - As with many powerful ultralights, the nose can get very high in full power (departure-type) stalls; nose can wander at max nose up (though I never found the stall to break over). With high mounted engine, powering up does not raise the nose, as it will on a certified aircraft. Pros - Trade-up method of adding the SC features provides a lower cost of entry. New fairing is less costly to ship and easier for builders to assemble. Kit delivery is among the best in the business; supplied from Leza-Lockwood by a long-proven system established between the companies. 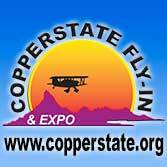 Flightstar gets high points from buyers for superior, concerned customer service. Great overall safety record. Cons - Not everyone will want to spend the money on the HKS engine regardless of its beneficial features. No dope-and-fabric option for those who prefer this covering. Overall, Flightstar is more costly than some low- or mid-range ultralights. If you must spend time painting your ultralight in some custom way, you won't want a Flightstar. 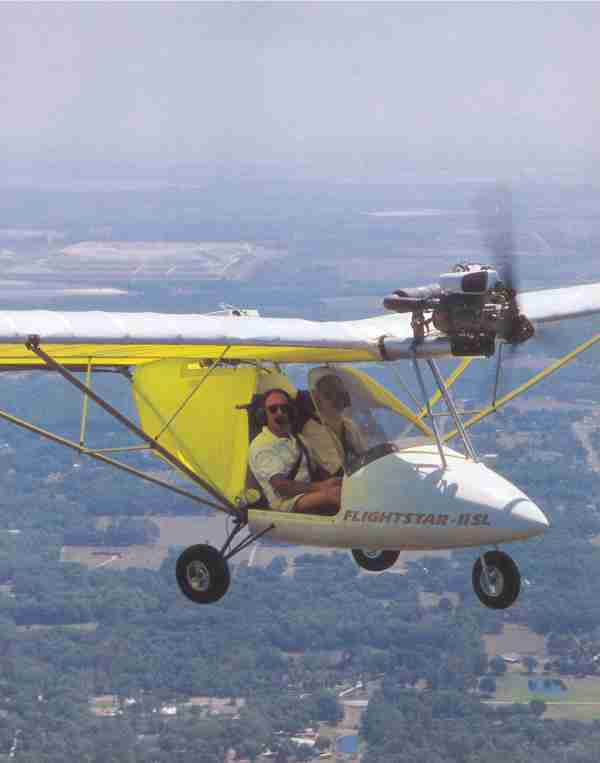 In August 1999,Ultralight Flying! reported on the Flightstar II SL. Thirteen months later, another report is needed as, once again, Tom Peghiny and Spark Lamontagne have upgraded their principal selling model. Flightstar is the name of the plane and Flightstar Sportplanes is the name of the company, and “refinement” ought to be permanently attached. I’ve followed many ultralights over many years. Some have changed a lot, some have seen almost no change. The Flightstar has almost constantly evolved. Why change this successful design? After all, it costs money to design, test and build new parts inventories. It takes time and more money to update assembly manuals. Why do all this if the ultralight is doing well? The reason is simple: to make a better product that more people will buy. At least the answer sounds simple; in fact, it may be surprisingly complicated to achieve. Before we get into how the ultralight flies, let’s review what makes this Flightstar II SC (Sport Cabin) different from the Flightstar II SL (Sport Light).